Mark Lynch who has announced his retirement from inter-county football. 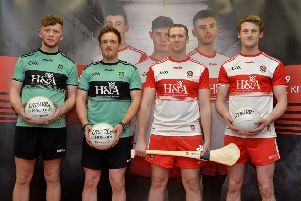 The Banagher club man, who picked up an All Ireland Minor winning medal in 2002, has been one of the focal points of the senior squad over the past decade and was shortlisted for an All Star in 2014. Mark in action against Paul Murray during the 2002 All Ireland Minor Football Final in Croke Park. However, increased work and family commitments have prompted the 32-years-old to make a decision which he admits will 'break his heart'. “Playing for Derry was something I always enjoyed and it breaks my heart to think I won’t do it again. For me there was always a real buzz wearing the red and white and representing my county, my club and my community. " Despite his departure, Lynch believes Derry have a bright future under Damian McErlain. “There are a lot of talented young footballers with bright futures coming through in Derry. I remember myself the step up from minor to senior level and how it forced me to really work and develop all areas of my game. "We need to give this latest crop the same space, opportunity and encouragement. I wish Damian McErlain and all the squad every success for the season ahead. I look forward to going with my family to support the lads because that’s what people did for me." Commenting on the retirement Derry Senior Manager Damian McErlain described Lynch as a "manager's dream." “Mark Lynch is a class act who has given unstinting service to Derry football for many years," explained the Derry manager, " He was a manager’s dream and a role model who made a real positive impact on all the players around him. A County Board statement also paid tribute to Lynch's contribution across a superb county career. 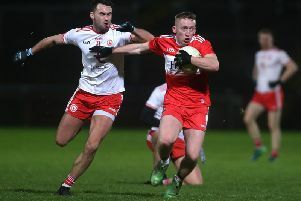 “When Mark Lynch arrived on the football scene it was clear that he was a young player with immense potential," said a spokesperson for Derry GAA.